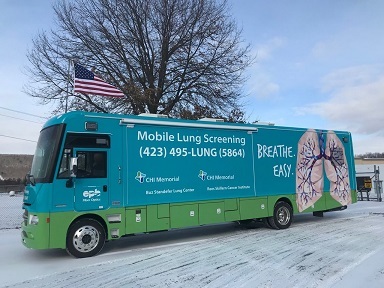 CHI Memorial’s mobile lung CT coach will be at several locations in Hamilton County during April. - Wednesday, April 17, 10 a.m.-3 p.m.
- Tuesday, April 18, 10 a.m.-1:30 p.m.
- Tuesday, April 23, 10 a.m.-3 p.m.
- Friday, April 26, 10 a.m.-3 p.m. Call 423-495-LUNG (5864) to discuss if a lung screening is right for you, or to schedule an appointment.